Horrible Harry says goodbye in the 30th anniversary finale of a beloved series! The last day of third grade is approaching fast, but a farewell to Room 3B isn't the only goodbye Doug has to say this year. Song Lee and Mary are busy preparing an end-of-year present for their favorite teacher, Mrs. Flaubert, but their excitement can't distract Doug from Harry's suspicious silence. When Harry finally admits that his family is moving to a whole other town, Doug can't believe his ears. How will he survive fourth grade without his best friend?! But Harry has a more pressing question: who's that moving in to the empty house across the street from him? And what could these new neighbors mean for their friendship? 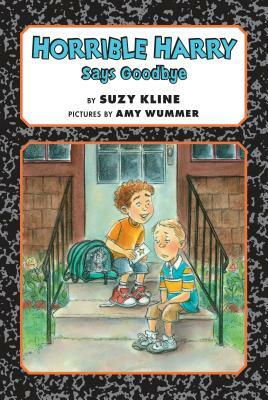 Suzy Kline has written thirty-five previous Horrible Harry books. She is also the author of numerous popular children's books, including the Orp books and the Herbie Jones series. She taught elementary school for twenty-seven years and now does scores of school visits in addition to her writing.